Guest House Films to release 'The Men Next Door', Coming to DVD Dec. 11th. Check out our review of 'BOYS WILL BE BOYS' from Pinata Productions. FREAK, written, directed & produced by Eric Casaccio. Read our film review! I like to call myself a dreamer, although believe me, I've been called worse. My name is Elliot London, and while you don't know me, like so many people in the world and like so many people in the LGBT community, I somehow feel that I know you. You are a community that has inspired me in ways impossible to measure -- or fully explain. So who am I? I'm a 31-year-old out director trying to make it in Hollywood. But unlike most others, perhaps, I'm using my passion for film to try to make a difference in the lives of the LGBT community, especially among young people. I was born in Australia, but my parents moved to Rockford, Ill. when I was young. I grew up poor, an only child, terrified of the day when my fellow classmates would find out my deepest, darkest secret -- that I was gay. For years, I carried with me the overwhelming shame that only another gay person can truly understand. (Perhaps you know what I mean.) As a teenager, like so many others, I endured taunts and bullying, senseless acts of cruelty, because I was perceived as being somehow different. I will never forget that day in high school when a classmate approached me on the bus and yelled "f*ggot" at me in front of my classmates, and then, for some reason -- impossible to comprehend even now, as an adult -- he spit on me. I went into shock in that moment and cried uncontrollably, and yet who could I later tell? My parents? My teachers? No, no one. The loneliness and isolation of being a gay teen can be as unbearable as the taunts themselves. It's amazing how an incident can still haunt someone 15 years later, but nevertheless, I refuse to be a victim, which is why I've devoted my life -- and my art -- to fighting for equality, and why every year I go back to Rockford to talk with LGBT students at my school about the importance of self-love and self-respect; it truly does get better. On Valentine's Day I released on the Web a three-minute film called The Wedding Dance; it's a heartfelt short about equality, with a surprising ending. I wrote and directed it, but it only came to fruition with the help of many, many talented people who also believed in my dream. I worked on this movie for months, and because financing film as an independent filmmaker is almost impossible, I used social networking with the help of IndieGoGo to raise the budget for the film. Specifically, I posted a series of short videos of myself explaining the project, with the promise that the donors would be updated on the progress. This way it becomes the people's film. I was amazed by the number of people, including many complete strangers, who donated. I made sure everyone who used their hard-earned cash was involved every step of the way. I am using now the release of The Wedding Dance to raise awareness of what a family can be. Most of all, it has given me the courage, against all odds in this economy, to get my full-length feature film, FRIEND, made. While Wedding focused on equality, FRIEND will center on anti-gay bullying in this age of Facebook and Twitter, when an ugly slur or vicious comment can be seen by hundreds if not thousands of people in an instant. I will never forget the day when Rutgers University student Tyler Clementi took his life. I was in my car when I heard the news, and I pulled over with such a sunken feeling in my gut. I told myself that if we can't educate the bullies, then we must equip the victims with the tools of self-worth. WithFRIEND my goal is to give the profits back to high school gay-straight alliances to educate and promote awareness from the ground up. I spend every waking hour trying to bring awareness of our films. Every view on YouTube for The Wedding Dance is so important, and I will not settle until I know that millions have viewed it. I owe it to the hundreds of people who donated their hard-earned money to make the film. Nor will I sleep until we have reached our goal to make FRIEND. It would be a dream come true for me if Ellen DeGeneres saw The Wedding Dance. A single tweet or Facebook post from Ellen acknowledging it could make all the difference in the world. People listen to Ellen, and with good reason. Ellen is one of our community's fiercest fighters -- and yet she does it with dignity and grace. A boxer with velvet gloves. Case in point? On Feb. 8, responding to the so-called One Million Moms movement against her hiring as JCPenney's spokesperson, she said so eloquently on her show, "Here are the values I stand for: I stand for honesty, equality, kindness, compassion, treating people the way you'd want to be treated and helping those in need. To me, those are traditional values. That's what I stand for." Like all of you reading this, I hope, I stand for those same things: honesty, equality, kindness, and compassion. Readers, I promise to lead. For more information of the FRIEND project and how you can get involved, visitwww.indiegogo.com/myfriend. FRIEND FILM from Elliot London on Vimeo. Elliot London has been working on a beautiful short film (THE WEDDING DANCE) about Equality in a different perspective. Take a look at this 3 minute film and consider posting it when the time is so right to educate one another. The objective with this project is to raise money for the feature film FRIEND. A film about coming out in 2012. A time now when things are so different with social networking. A time now that a child might not have the correct tools to coupe with humiliation in an instant world. FRIEND is about giving back. Its a movie about accepting and loving oneself but most of all it is about educating. With the proceeds from this film Elliot London is going to be donating the profits to groups that help educate at risk youth... If we can raise $10,000 to make our last film with social networking. Take a look at the campaign on IndieGoGo. Of The Film You Helped Fund! Radar Online has been following Out Film Maker Elliot London. Today is the day we've all been waiting for: the release of his new short film THE WEDDING DANCE! Read more about it HERE. 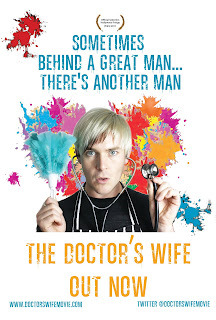 Guest House Films is proud to announce that it has acquired the worldwide rights to Jonathan Duffy's feature-length Australian documentary The Doctor's Wife. Following a film festival run starting this summer, Guest House Films plans to release the film on DVD and VOD this coming fall. The endearing documentary follows Duffy and his partner, Dr. Vincent Cornelisse, as the couple makes the angst-inducing decision to leave the Australian metropolis of Brisbane for Mundubbera, a small country town in Queensland. The Doctor's Wife explores the couple's journey, as a rural doctor and his partner who had never lived in the country before, as they move into the small town and wonder how they will be received. To their surprise, the town welcomes them with open arms, especially when Duffy becomes involved with a variety of local activities while Cornelisse focuses on his medical practice. The couple ultimately strikes a positive chord with the citizens, leaving everyone forever changed for the better. The Doctor's Wife has had a very successful film festival run in Duffy's native Australia, including an upcoming screening at the Mardi Gras Film Festival in Sydney. This is the first film from director Duffy, who also serves as the film's writer, producer and editor. "I'm very happy Guest House Films has taken on The Doctor's Wife as I'm a big fan of the company's previous successes," said Duffy. "My film has been a huge part of my life for nearly three and a half years, so I wouldn't hand it over to just anyone." For more information about Guest House Films, visit the company's official website. For more information on The Doctor's Wife, visit the film's official website and Facebook page. GayFilmNation is a gay film media outlet where gay indie film makers can reach out to their audience.